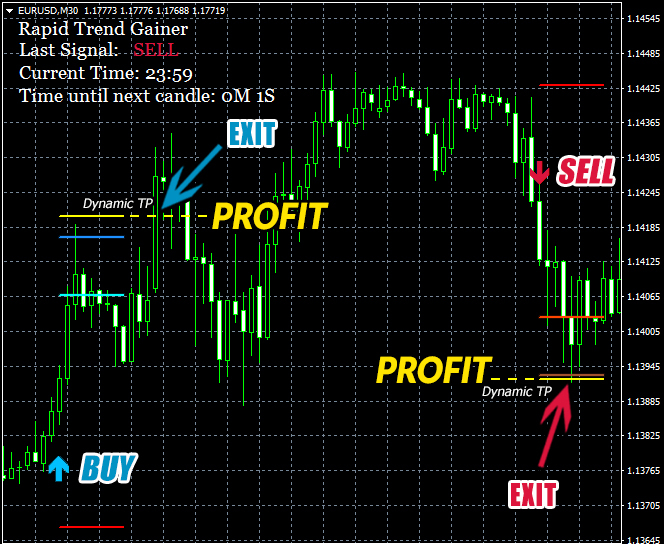 Rapid Trend Gainer is the only trend indicator you need to trade within the M15, M30, H1, H4 and D1 timeframes. Rapid Trend Gainer never repaints its signals and is designed to provide you with accurate and reliable information. This tool uses the latest algorithms to predict changes in the market and give either a buy or a sell signal. In addition, Rapid Trend Gainer is capable of sending you real time notifications on your phone or tablet, so that you can still make use of this tool when you’re on the go. No one can never fully predict the market, but by constantly analyzing trends in foreign currency and computing with complex trading algorithms based on constants in the marketplace, Rapid Trend Gainer can get a hell of a lot closer to doing it than a human can. It doesn’t matter what currency pairs you decide to trade, Rapid Trend Gainer is equipped to handle it. This is trading in the M15, M30, H1, H4 and D1 timeframes made simple.